Our first trip to Italy was without the benefit of any knowledge on my part of Italian. My wife with he Sicilian parents had a knowledge of some words and phrases. I realized this was a disadvantage but not the end of the world. So much English is spoken in Italy most people can get along. Most restaurants in the tourist areas have dual or triple language menus. English, German, and Italian are prevalent. I want to go further and speak to people and know what the road signs say. Not having access to an Italian teacher, I took another route. 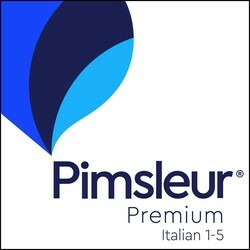 Pimsleur had a CD course in Italian. I bought the course and ripped the CD’s to my iPod. That was the beginning. It is a good way to learn conversational Italian. Eventually I progressed from levels 1 through 5 which encompasses about 48 hours of lessons. I did enjoy it as I was able to listen while driving or riding my bicycle. As you can see, it is not cheap. Try the audio only from Audible for a more reasonable price. Beyond this I also used duoLingo. This is a free program with excellent content. Exercises progress from basic to upper intermediate. It is easy and I have been using if for about 6 months now. You can progress at your own pace and go back to. From time to time you may be asked to donate, but this is minimal. An excellent program for iPhone, tablets, and Android products. You must have WiFi or cellular data connected. There are many exercises to improve listening and writing skills. Voice recognition is available for pronunciation practice. Next there is Rosetta Stone. This is my least favorite method. The program has five levels and retails for about $200-250 on Amazon. It is available for PC and MAC. It does a good job of teaching vocabulary and grammar, but I find it painful obtuse. In many cases you have to decipher a photograph and answer questions based upon your interpretation of the picture. Some times the photos are not clear and you may give a wrong answer. It is your choice on Rosetta Stone, I just find it slow. But the content is good. It has voice recognition to help you with pronunciation.
. There is also a subscription version. Te computer version is copy protected to one PC or Ma and can not be used on another until it is deactivated. There are other programs out there. Transparent Language as a program for phones and tablets. It is subscription based. Seems ok. They offer a free blog with the word of the day. Michelle Thomas has CDs for many language and they are priced reasonably.